After all four events conclude, the player with the most tour points will win and collect an additional $100,000. Unsurprisingly, after only one year, the Grand Chess Tour has become a staple in the chess calendar of the top players and fans alike as players compete for over $1 million in prize money. 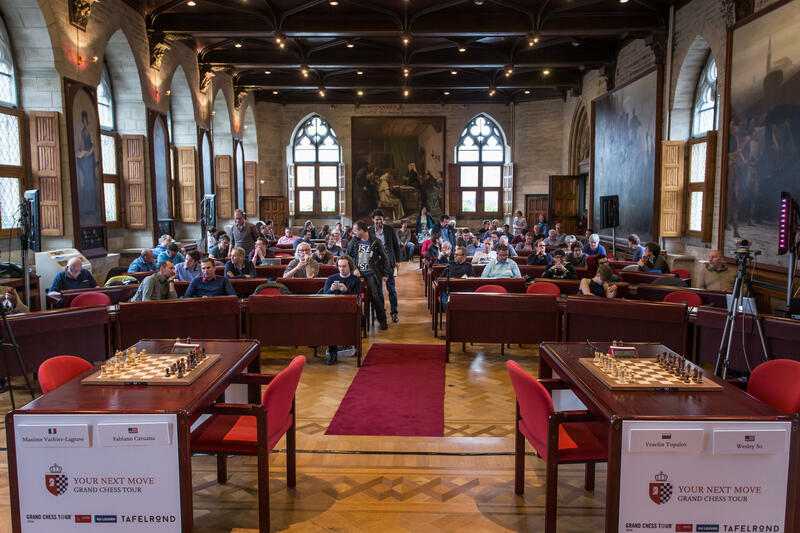 Leuven, Belgium, hosted the second leg of the Grand Chess Tour. The tour kicked-off with two rapid and blitz matches in Paris, then continued with the same format in Leuven, Belgium. Unlike classical chess, where one game can last up to six hours, the schedule was more grueling with 27 chess games being played over four days. The faster time controls allowed the players to play nine blitz games, or five rapid games, in one day. These formats are very audience friendly because they are action packed and more “human” as they involve so many mistakes that we are not accustomed to seeing from the world’s very best. It is not every day that a top player makes an illegal move and has to forfeit the game or a former world champion walks into an elementary checkmate. In top-level, classical chess the margin of error is so small that it can take hours of deliberation and help of computerized chess engines to evaluate and decipher the benefits of each possible move. Also, the faster time controls allow the audiences to watch 45 blitz games in five hours instead of the standard five slower games. On the downside, the faster time controls do bring down the quality of the game and increase the randomness factor. But there were quite a few attacking masterpieces and endgames played out so precisely that they could be used as how-to guides. The first leg of the tour in Paris was won by American Hikaru Nakamura, who bested the current world champion Magnus Carlsen to collect 13 tour points and $37,500. After only a few days’ break, the tour moved to Leuven where Carlsen came back with a vengeance to claim the tournament convincingly, yet again proving that he is the best player in the world not only in classical but also in blitz and rapid chess. The two events were also a success for America’s third strongest player, Wesley So, who quietly finished fourth in Paris and second in Leuven. Unfortunately, Carlsen was a wildcard for these stops (not playing in all four locations) so he cannot collect Grand Chess Tour points. Therefore, So and Nakamura are tied for first place overall in the Grand Chess Tour heading into the Sinquefield Cup. With the rapid and blitz portions ending, there are two classical events to look forward to. In less than six weeks, the world’s very best will battle it out in St. Louis. This is especially thrilling for the U.S. fans as three Americans are in the tour. The current U.S. champion, and St. Louis resident, Fabiano Caruana, struggled with the faster time controls but his incredible undefeated start at the 2014 Sinquefield Cup is still fresh in the minds of the rest of the field. Caruana will be in his element, as he has historically done much better in classical chess and in St. Louis, where he won the Sinquefield Cup, was crowned as a U.S. champion and beat Nakamura in an exhibition match that included both rapid and blitz. The three Americans are stylistically different, which allows fans to pick their favorite accordingly. Although blitz and rapid produce more excitement for the fans and are less time consuming, classical chess yields higher quality games that are timeless and are studied for generations. The coverage of the event with the world-class commentary team helps the amateurs to break down the highly sophisticated ideas and moves of the top players. The high energy combined with the deep knowledge of both chess and the history of the game of the commentators makes watching the six-hour commentary pleasurable. The commentary for the Sinquefield Cup will stream directly on GrandChessTour.org from the Chess Club and Scholastic Center of Saint Louis, which will also include two separate commentary teams for the live audiences at the Kingside dinner and the Chess Hall of Fame. For the first two weeks of August, St. Louis will clearly be the chess capital of the world. Women’s Grandmaster Tatev Abrahamyan is No. 3 rated women’s player in the United States. On Chess is provided by the Chess Club and Scholastic Center of St. Louis. The Grand Chess Tour was introduced to the chess scene in 2015 to give the world’s very best players a new series of tournaments to compete in and also to promote chess to the general public. Not only were the players treated as superstars and got to play in three of the most beautiful places in the world for a large sum of money, but each tournament hosted many activities for the chess fans.